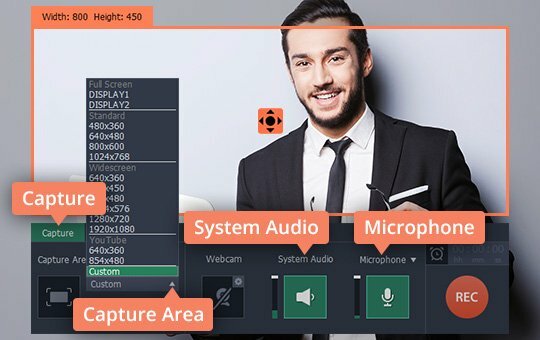 Do you want to capture video from the screen to preserve a webinar, a Skype conversation, an online film, or screen activity within a program? There are several ways to record what’s on your screen: you can use a dedicated recording app or the built-in tools in other programs. 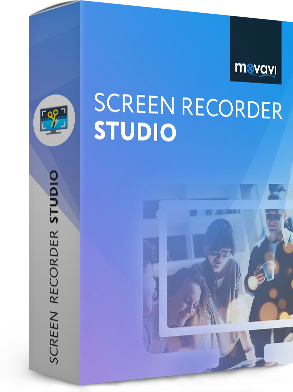 If you want a high-quality recording, use a full-featured program like Movavi Screen Recorder Studio. 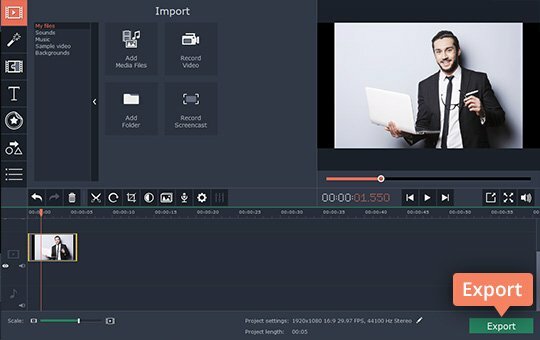 This powerful and easy-to-use app lets you record the screen with audio and edit the footage however you want. You can capture any screen activity and create complete screencasts, tutorials, vlog posts, and more. Learn how to save video from your computer monitor in the instructions below. Download the program, launch the setup file, and follow the installation steps on your screen. Launch the program and click Record screen in the start-up window. Adjust the capture frame by pulling on its edges. If you want to record screen with sound, click the System Audio icon (it needs to be highlighted in green). Click the Microphone icon if you want to record your voice as well. You can also specify the length of the recording or set the exact times when the program should start and stop capturing. To do this, go to the Capture menu and select the Schedule Recording... option. Click REC and be ready to start playing the target video after a short countdown. You can pause or stop the process by clicking the appropriate buttons. Alternatively, you can click F9 to pause or F10 to stop. When you stop the recording, you’ll see a preview window where you can review the video and cut it if necessary. If you’re ready to save the result, click Save As and choose the format you want to save it in. You can also use the built-in video editor: to do this, click Open in Editor. If you want to make the video of your screen look even better, you can edit it until it’s just the way you want it. Split the recording into segments, crop or rotate it, enhance colors, add filters, apply effects, and more. To save your changes, click Export and choose the desired output format. You can also optimize the video for viewing on a mobile device or share it on YouTube right from within the program. 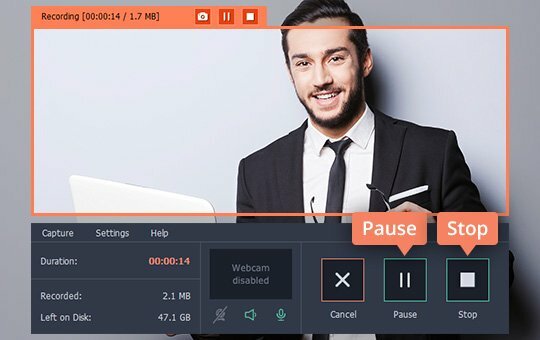 There are other ways to record online video and copy the results to your hard drive – you can use recorders with limited functionality, such as CamStudio and Icecream Screen Recorder. These programs can capture video from your display, but don’t let you edit it, except for some basic trimming. The number of output formats in these apps is usually quite limited, too, and sometimes you can’t change the format at all. 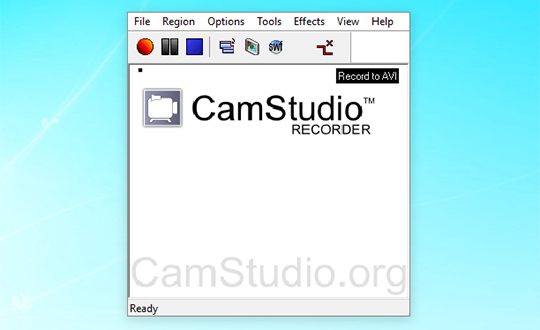 In CamStudio, go to the Region menu and choose the appropriate option: capture the full screen or the selected region. Click the red Record button to start recording. When you’re ready to stop, click the blue Stop button. 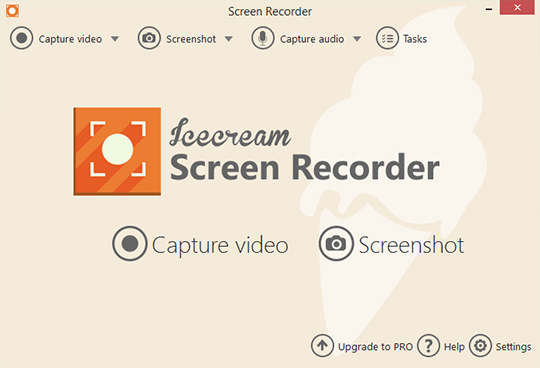 In Icecream Screen Recorder, open the Capture video list and choose the area you want to record: the full screen or a custom area. Click Rec to start recording and Stop to finish. You can also use the recording tools built into other programs to record your screen, like Microsoft Office PowerPoint and QuickTime Player. These apps are primarily designed for other tasks, so they only let you capture screen video without editing. 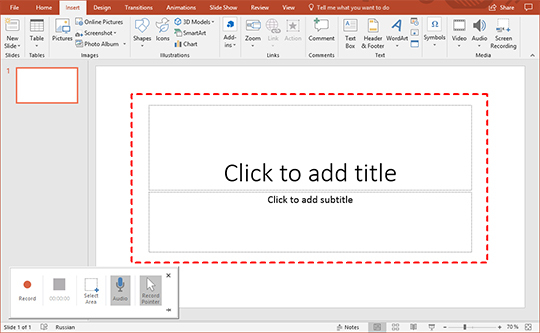 In PowerPoint, open the Insert tab and select Screen Recording, then click Select Area. Draw the capture frame and click Record. To save the recording, open the File menu and click Save – the recording will be embedded into the slide. Click Save Media As to save your video as a separate file. 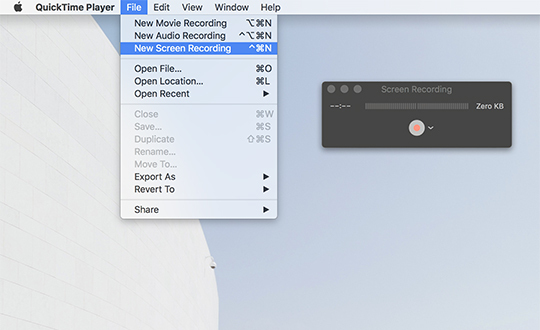 In QuickTime, open the File menu and select New Screen Recording, then click the Record button. Click Stop to stop recording. You can trim your video, but no additional editing options are available. To save the changes, go to the File menu and click Save As. *For this article, we used Movavi Screen Recorder Studio 9, CamStudio 2, Icecream Screen Recorder 5, Microsoft PowerPoint 2017, and QuickTime 7.